And the worlds collide! The last two weeks I’ve been busier than usual, both with my thesis work and my work-work. Right now in my job we are trying to fulfill a vacant position in my unit, so there’s been a lot of resume reading, vetting, and interviewing. To top it off, I attended a Leadership Symposium for Librarians last week which was extremely interesting to me as it never seems that Leadership comes up as a topic of conversation in my daily library life, but it’s obviously a topic of interest to many other librarians. The topic of gender was briefly mentioned and it made me happy to see that others felt the way I did in terms of how gender plays a role in negotiating our perception as women in the library field. One example that was brought up was that it seems that in some situations when you are trying to forge through with an innovative idea, that it can be taken in different ways if the idea originates from a man, woman, black woman, gay person, etc. This issue, which didn’t have an easy answer, was at least brought up for discussion in light of all the positive talk that was going on during the symposium. Interestingly, in the last couple of weeks certain aspects of my life have been complimenting each other. Perhaps its because I’ve managed to write about a thesis topic that really interests me or maybe I really did find a calling as a Librarian, or gender just permeates everything, I don’t know. I think the clip below is pt. 45 but they’re up to pt.54 or something now. 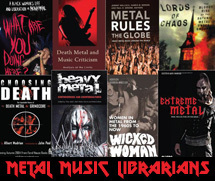 Each video showcases a variety of female fronted extreme metal bands in the genres of Death, Black, Grind etc. It’s pretty concise and goes to show just how varied in ethnicity some of these bands are.